When I was going through the list of films at this years DOC NYC the first film I marked as an absolute must see film was Death Metal Angola. There was something about the name that hooked me. I had to see the film. And now that I have I can honestly say that you should put this on the short list of must see films. Sonia Ferreira and Wilker Flores run an orphanage in Huambo in Angola. They also love heavy metal music. Taking their love of music and its healing power, they organize the first rock festival in Angola. 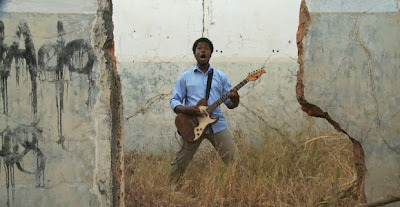 Death Metal Angola is a wonderfully surprising film. Taking us somewhere most of us have never been and showing us things we never expected it does what all of the best documentaries do, it opens our eyes to something new and wonderful. Here it’s the power of heavy metal to bring hope and release to a people suffering after long years of war. To be honest I was intrigued by the notion of heavy metal music being played in Africa. As a heathen white American I’ve not really run across many blacks making heavy metal music, so I couldn’t see them making death metal or black metal music, which is very often portrayed as coming from Scandinavia and the white supremacists there and in Europe. I wondered if what I was going to see and if the title was just a come on. While the film is framed by and filled with music, the film is also about Sonia and Wilker who run an orphanage and who were brought together by music. Caring for 55 boys they struggle to build better men by showing them the meaning of family and the correct way to behave. They are a couple that anyone would be proud to have as a mom and a dad. This is a truly special film. It’s a trip to another place into a life that most of us can barely imagine. A wonderful film about life and music, this is one of the best films I’ve seen so far at DOC NYC. While the film perhaps is a bit skimpy on the putting together of the festival, it more importantly fills the time with wonderful music and people. If the best documentaries takes us some where we’ve never been and show us something we’ve never seen or expected then Death Metal Angola is one of the best. See this film when it plays Saturday night at IFC- hell I’m seriously staying up past my bedtime to see it again, large and loud.